If a connection is present in the workspace of the teacher computer but is displayed as "Not connected" thumbnail please try to discover standard network code of the connection error. Error 10060: Connection timed out. - client computer is turned off or disconnected from a network. - IP address of a connection is invalid: try to use host name addressing. 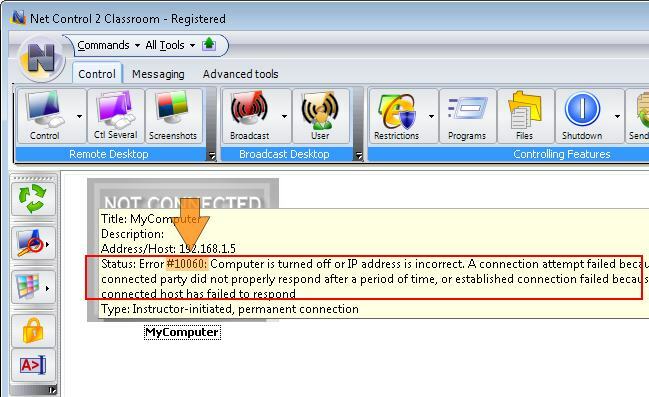 - if remote computer was connected using network name (not IP address), try to restart your server (if your network have a domain) or a router; if the issue still persists please consider to use "user-initiated connections"
- if the computer was connected earlier, but cannot be connected again after restart of the client computer, try to use host name addressing. - Net Control 2 client service was not installed on this computer. - Net Control 2 client service was blocked by Windows Firewall or third-party software or hardware firewall. For more information about firewall configuration please refer to the following chapter. - IP addressing used but the network uses DHCP/dynamic IP addresses. Try to use host name addressing. - verify that discovered DNS name of the connection is correct. Error 10038 generally means intermediate error, which most often will be transformed to one of the specified above errors in 5-15 seconds.